To compare the progression of myopia in eyes that underwent unilateral refractive surgery with non-operated eyes. Three patients who underwent refractive myopic correction in one eye are described. The collected preoperative and postoperative data included age, gender, subjective refraction, best corrected visual acuity, and uncorrected visual acuity. The first patient (19-year-old woman) had photorefractive keratectomy in her left eye and the myopic progression was 1.20 diopters (D) (3 years postoperatively) compared to −2.50 D in her non-operated eye. The second patient (30-year-old man) had laser-assisted in situ keratomileusis in his left eye with a myopic progression of 0.25 D compared to 0.75 D in his non-operated eye (10 years postoperatively). The third patient (22-year-old man) underwent photorefractive keratectomy in his right eye with no myopic progression compared to −1.50 D in his non-operated eye (3 years postoperatively). These three cases suggest that refractive surgery for myopia correction may be associated with a slower progression of myopia postoperatively. Using progressive corneal reshaping as a therapeutic approach is based on the theory that both central and peripheral retinal images need to be in focus to prevent myopic progression.16,17,23,24 Orthokeratology is one of the most studied approaches, and it has been shown to be effective in slowing myopic progression.25–27 We postulated that corneal reshaping with refractive surgery could have an effect on myopic progression similar to that of orthokeratology because it results in changes to the central cornea and not to the peripheral cornea, which occurs with orthokeratology lenses. 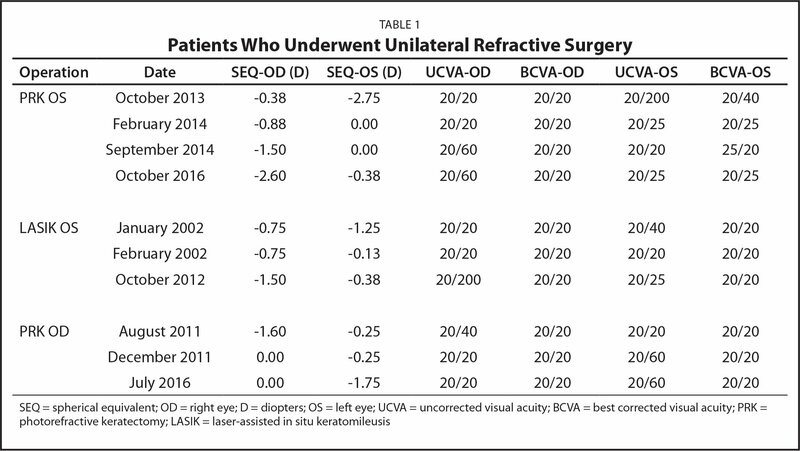 Table 1 shows the preoperative and postoperative data of three patients who had unilateral refractive surgery. The progression of myopia was compared between the operated eye and the non-operated eye. A healthy 19-year-old woman with anisometropia underwent successful photorefractive keratectomy (PRK) in her left eye. Surgery was unilateral because the uncorrected visual acuity (UCVA) of her right eye was 20/20. Refraction was −0.25 −0.25 × 55 (−0.38 D spherical equivalent [SEQ]) in her right eye and −2.75 −0.50 × 150 (−2.50 D SEQ) in her left eye. The preoperative UCVA and best corrected visual acuity (BCVA) of her right eye was 20/20. Her left eye preoperative UCVA was 20/200 and BCVA was 20/25. Two months postoperatively, the manifest refraction was −0.50 −0.75 × 53 (−0.88 D SEQ) in her right eye and +1.25 −0.75 × 161 (+0.88 SEQ) in her left eye. At the 1-year follow-up visit, the postoperative refraction of her right eye was −1.25 −0.50 × 50 (−1.50 D SEQ), her UCVA was 20/60, and her BCVA was 20/20. The SEQ of her left eye was plano. At her 3-year follow-up visit, refraction was −2.25 −0.75 × 55 (−2.63 SEQ) in her right eye and −0.25 −0.25 × 130 (−0.38 D SEQ) in her left eye; her UCVA and BCVA were 20/20. This patient underwent a myopic progression of −2.25 D in the non-operated right eye compared to −1.20 D in the operated left eye during 3 years of follow-up. A 30-year-old man had a right eye manifest refraction of −0.75 D, a UCVA of 20/40, and a BCVA of 20/20. In his left eye, the manifest refraction was −1.25 D, the UCVA was 20/40, and the BCVA was 20/20. He decided to have unilateral LASIK in his left eye. At the 1-month follow-up visit, the postoperative refraction and visual acuity of the non-operated right eye showed no change. The refraction of the operated left eye was +0.25 −0.75 × 30 (−0.13 D SEQ), the UCVA was 20/20, and the BCVA was 20/20. Ten years later, he noticed a deterioration of vision of his non-operated right eye. An ophthalmic examination revealed a right eye refraction of −1.00 −1.00 × 145 (−1.50 D SEQ), a UCVA of 20/100, and a BCVA of 20/20. The refraction in his operated left eye was −0.25 −0.25 × 6 (−0.38 D SEQ), the UCVA was 20/25, and the BCVA was 20/20. The patient had a myopic progression of −0.75 D in his non-operated right eye and a small myopic change of 0.25 D in his operated left eye 10 years postoperatively. A 22-year-old man with moderate myopia underwent PRK in the right eye. The preoperative refraction in the right eye was −1.50 −0.25 × 170 (−1.63 D SEQ), the UCVA was 20/40, and the BCVA was 20/20. The refraction in his left eye was −0.25 D, the UCVA was 20/20, and the BCVA 20/20. At the 3-month postoperative follow-up visit, the SEQ of the right eye was plano and there was no change in the refraction in his non-operated left eye. At the 3-year follow-up, the postoperative SEQ of the right eye was plano with a UCVA of 20/20 and a BCVA of 20/20. The manifest refraction in his left eye was −1.75 D, the UCVA was 20/40, and the BCVA was 20/20. He underwent 1.50 D of myopic progression in the non-operated eye with a negligible change in refraction in his operated eye. We report three cases of unilateral refractive surgery with a slow myopic progression in the operated eye compared to the non-operated eye (3 to 10 years postoperatively). This suggests, similar to orthokeratology, that corneal reshaping with laser refractive surgery may slow the progression of myopia. Two of our patients were young (19 and 22 years old) and one patient was older (30 years old). The amount of myopic progression in the non-operated eye was slower in the older patient compared to the younger patients. However, despite the patient's age, the eye that underwent refractive surgery progressed less than the non-operated eye. Orthokeratology is the preferred method for corneal reshaping, with the purpose of correcting a peripheral defocus in myopic patients.22,26–28 Several studies showed that changes in peripheral refraction can decrease myopic elongation.9,29–33 Walline et al.16 observe 40 children who had received corneal reshaping orthokeratology lenses for 2 years and compared them to controls. The corneal reshaping group had a significantly slower annual rate of change in axial length than the soft contact lens wearers (the mean difference in annual change was 0.16 mm, P = .0004).16 Sankaridurg et al.18 performed a case–control study and compared special flattening contact lenses to single-vision sphero-cylindrical spectacles. Their results were similar to those reported by Walline et al.16 in that the flattening contact lens groups showed slowing of refractive progression and had less axial elongation at 1-year follow-up compared to a control group. Hiraoka et al.26 performed a 5-year follow-up study of overnight orthokeratology on elongation of the axial length in childhood myopia. They found that the annual increases in axial length was significantly reduced with the orthokeratology lens compared to single-vision spectacles. Queirós et al.36 characterized the axial and off-axis refraction across the horizontal meridian of the visual field before and after LASIK surgery for myopia. Peripheral refraction was evaluated by an open field autorefractor preoperatively and 3 months after LASIK surgery. The central and peripheral refractions were measured on the horizontal meridian up to 35° of eccentricity, and the peripheral refraction was shown to be affected by myopic LASIK surgery. Unlike orthokeratology, which increases peripheral myopia, LASIK reduces myopia across the horizontal visual field to at least 35° from fixation. However, this reduction may be at a lower rate than the reduction of central myopia, thus reducing the overall peripheral defocus. Ma et al.34 reported that the mean spherical component of refraction in myopic LASIK remained highly myopic away from the center when compared to a control group of emmetropic and untreated myopic eyes. Thus, leaving the peripheral refraction somewhat myopic after LASIK may reduce the peripheral defocus and slow myopic progression. The main interest in slowing the progression of myopia is primarily relevant for children. Reports are limited because refractive surgery is not usually performed on children. Fecarrota et al.35 surveyed the current literature for indications and outcomes of refractive surgery in children. They concluded that refractive surgery is a good option for children with amblyopia and strabismus who fail treatment with spectacles or contact lenses. They also recommended that its use should be approached cautiously and preferably in a research setting until there is more evidence of the safety of refractive surgery in children. We suggest that, similar to orthokeratology, corneal reshaping with laser refractive surgery may slow the progression of myopia. However, this study is limited by its small number of cases and the fact that the changes in axial length of the eyes were not documented during the follow-up period. Large randomized studies with customized ablation protocols aiming to prevent the peripheral defocus are warranted to confirm this possibility. Goldschmidt E. Ocular morbidity in myopia. Acta Ophthalmol Suppl. 1988;185:86–87. Pararajasegaram R. VISION 2020-the right to sight: from strategies to action. Am J Ophthalmol. 1999;128:359–360. Gwiazda J, Thorn F, Bauer J, Held R. Myopic children show insufficient accommodative response to blur. Invest Ophthalmol Vis Sci. 1993;34:690–694. McBrien NA, Moghaddam HO, Reeder AP. Atropine reduces experimental myopia and eye enlargement via a nonaccommodative mechanism. Invest Ophthalmol Vis Sci. 1993;34:205–215. Aller TA, Wildsoet C. Results of a one-year prospective clinical trial (CONTROL) of the use of bifocal soft contact lenses to control myopia progression. Ophthalmic and Physiological Optics. 2006;26:8–9. Queirós A, González-Méijome JM, Jorge J, Villa-Collar C, Gutiérrez AR. Peripheral refraction in myopic patients after orthokeratology. Optom Vis Sci. 2010;87:323–329. Mutti DO, Sholtz RI, Friedman NE, Zadnik K. Peripheral refraction and ocular shape in children. Invest Ophthalmol Vis Sci. 2000;41:1022–1030. From the Department of Ophthalmology, Meir Medical Center, Kfar Saba, Israel (SS); the Department of Ophthalmology, Rambam Medical Center, Haifa, Israel (ND-S); Care Vision Refractive Clinic, Tel Aviv, Israel (IK); the Department of Ophthalmology, Barzilai Medical Center, Ashkelon, Israel (IK); and the Faculty of Health Science, Ben-Gurion University of the Negev, Beer-Sheba, Israel (IK).